Brains: You could say that she’s the female Doogie Houser of music with a B.M., Professional Music, from the Berklee College of Music as well as one of the youngest faculty members to teach there, having started teaching there at the tender age of 19. Talent: There is no question that this girl can blow almost anyone off the stage with her incredible talent on the guitar. Catch one of her shows or videos on YouTube and you’ll be quick to agree with me. Beauty: While she is brimming with intellect and talent, Ms. Brosh’s beauty will captivate her audience while giving them an audio lobotomy. Have I piqued your interest? Good. Now I’ll tell you about her disc. If you’ll first read the liner notes of the disc, you’ll be given some handy info that I’ve never seen on a disc before: counter indicators for where who is doing which solos within a tune (i.e., “Andy Timmons – Guitar Solo on track 7 (2:48 – 3:42)). I love it! The album opens with the goose-bump producing tune, The House of Tomorrow. By closing your eyes, you can envision fog and blue spot lights as Nili teases your ears with just a sample of what you are about to experience for the remainder of the disc. I have found myself setting this shortest of this CD’s tunes on repeat so that I can continue to enjoy its vibe. Brosh’s crowd pleasing, Lost In Suburbia, demonstrates her songwriting prowess that is often not evident in peers many years her senior. As with all of her creations, Nili writes for sound and effect, not just to try to create a reason to show off fancy finger work. The tunes just make sense musically and atmospherically. The album downshifts to the easy listening start of Hat Tricks, the longest tune on House, clocking in at barely over six minutes. However, don’t be fooled by the Adult Contemporary sound of the opening minutes of this song. The song is peppered with the incredible classical guitar work of Nili’s equally talented brother, Ethan, who, incidentally, is the inspiration behind Nili’s interest in guitar. Hat Tricks soon ramps up to some incredible finger work that will tickle the ears of those who appreciate the technical aspects of true guitar wizardry. Keyboard work by Ray Reich adds to the unique nuance of this intriguing and entertaining piece. High Strung sounds like you’ve been invited to a jam session of some of the best and brightest musicians in Boston. Joining Nili on guitar is some great guitar work by Word Strickland backed by a great drum foundation offered up by Masashi Ushijima and Tyreek Jackson on bass. The title track shows up fifth in the line-up. Words that come to mind in describing this tune are: Moving. Powerful. Uplifting. Triumphant. Through The Looking Glass will take your mind on a magic carpet ride to those places one personally associates with these descriptions. Probably one of the most addicting tracks on this disc is Placebo (yes, pun intended). Every time I listen to this tune, I discover more melodic gems chiseled by Brosh’s incredibly talented hands. I would say that this is on my short list of favorites on this album (if I was forced to have to make a short list, that is). Andy Timmons (who turned Boomerocity on to Ms. Brosh) shows up with Nili to add to the fun and frivolity on Wafer. Intricate and, yet, not too “busy”, this is just a fun (I know, I’m repeating myself) piece to listen to over and over again. What I would pay to watch these two perform this one on stage with an admiring crowd! It will, no doubt, leave the audience collapsing in their seats, fanning away the vapors. The blazing, white hot Never Be Enough and the warp speed of Typsy Gypsy put a nice bow on this phenomenal piece of work. Josh Kwolek adds some pretty tricky bass work on Gypsy that will make bass purist sit up and take notice. You’ll want to order this CD now! In fact, this would be a great stocking stuffer or gift for the music nuts in your life. If I didn’t already own this gem, I would be dropping heavy hints to my family to make sure that Santa Claus dropped this CD down our chimney. 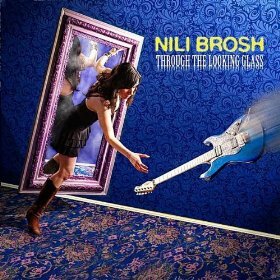 As of this writing, there is only one place to purchase Through The Looking Glass and that’s at www.nilibrosh.com. While you’re there purchasing multiple copies of her CD, check out Nili’s blog and see if she’s going to be appearing somewhere near you. Trust me: she’ll be a real treat to watch and listen to.